I’m Wanda L Ball. I am a writer, blogger, self-published author – youth ministry bible study teacher, wife, mother, business professional and follower of Jesus Christ. Click Here to view my Amazon Author Page. 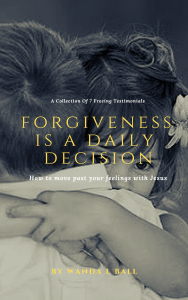 Following Jesus 101 Ministries introduces, encourages or reclaims faith, hope and passion in your personal relationship with Jesus Christ on a daily basis. If you don’t know Jesus, need a boost of support or advice about Him, my blog promises to be that for you! My life as a Christian hasn’t been easy. I’m sure we can swap stories of all the struggles one goes through in this life. Family struggles. Professional struggles. Personal struggles. Christian struggles. As long as we are on earth we. will. have. struggles. period. He promised to never leave us or forsake us. (Deuteronomy 31:6) He will be with us until the end of time. (Matthew 28:20) He’s a friend that sticks closer than a brother. (Proverbs 18:24) He’s our everything. I’ve been a Christian writer for 20+ years, a published author, business owner for 10+ years and real estate professional for over 15+ years. Those are great achievements that God has allowed me to accomplish. I will always write for God, but these man-made accolades really don’t matter in the scope of things. What matters is that I’m saved and will spend an eternity with Jesus, because I’ve decided that his plans for me are far greater than my own! Prayer (regularly conversing with God). Becoming students of His word and teachings (being disciples). Sharing the blessings of our spirituality with others (evangelizing). Giving God glory and praise through speech, behavior, and songs (worship). So, how do you learn how to follow Jesus? Following Jesus is having a personal relationship with Him through faith, prayer and his word in the Bible. One on One. It’s getting to know Him and Him getting to know you (even though He already knew you even before you were born). My calling is to also help educate you, the Christian believer, by sharing more about Jesus through blog posts, bible studies, community groups, books and courses. Everyone has a calling and gift! Why are you here? What has God called you to do? As a follower of Christ, you must allow Him to lead and guide you through life’s journey of ups and downs – trusting that the downs have an ultimate purpose and meaning – for your good. I invite you to join me on this journey to discover your calling! If you prayed this prayer and have accepted Jesus Christ as your personal savior – Welcome to the body of Christ! Still don’t know Jesus? Here’s why you should! Are you a New Christian? Here’s how to build your new life with Christ! 40 Days and 40 Nights with Jesus Bible Challenge – Learning more about Jesus’ life through the eyes of His disciples and followers for the next 40 days & nights will give you first hand accounts of his love, power, death and resurrection that was encountered for you, His sheep! Ready to commit for the next 40 days?